Ear, Nose & Throat including earaches, sinusitis, rhinitis, allergies, laryngitis, toothache. Respiratory including colds & flus, bronchitis, asthma, COPD. Musculoskeletal/Pain including back pain, neck pain, knee pain, hip pain, frozen shoulder, TMJ, sciatica, rotator cuff impingement, arthritis, carpal tunnel, fibromyalgia. Gastrointestinal including food allergies, nausea, morning sickness, indigestion, diarrhea, constipation, ulcers, colitis, heartburn, GERD. Skin including acne, eczema, psoriasis and dermatitis. Circulatory including hypertension, hypotension, arteriosclerosis, angina pectoris. Urogenital including cystitis, stress incontinence, prostatitis, night-time urination. Gynecological including PMS, menopausal syndrome, hot flashes, endometriosis, menstrual irregularity or severe pain. Pregnancy, labor & delivery including like morning sickness, back pain, fatigue, delayed labor, breech presentation. Psycho-emotional & Neurological including depression, anxiety, insomnia, headache, migraine, trigeminal neuralgia, intercostal neuralgia, post-stroke paralysis, dizziness, shingles. Blood SugarImbalances including prediabetes, diabetes, high blood sugar, low blood sugar, fatigue, headaches. Want to learn more then check out our FAQ or What to Expect or My Specialities pages. Subscribe to our blog and receive the 3 ancient secrets for stopping colds and flus in their tracks. You have been added to our newsletter and mailing list! Yay! 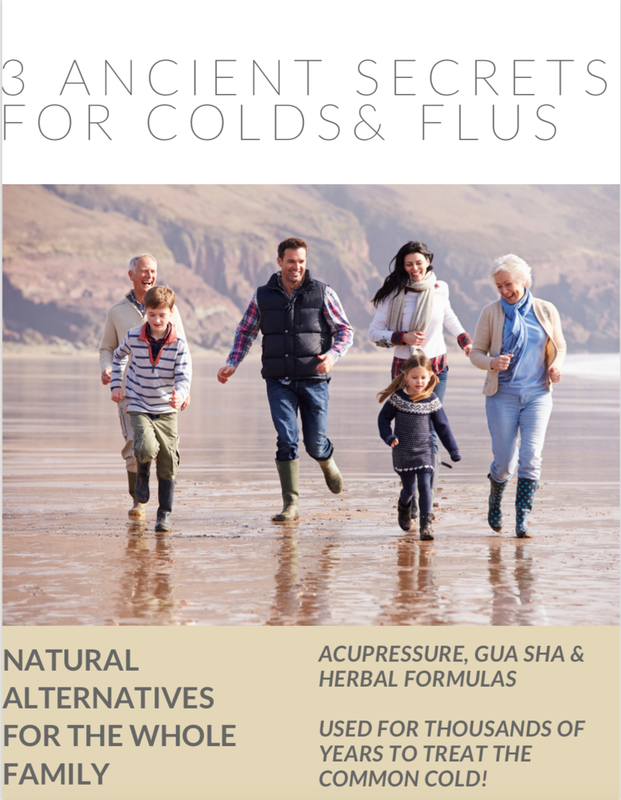 Click here to download your copy of 3 Ancient Secrets to stop colds & flus. If at any time you wish to unsubscribe, you may do so at the bottom of the email. And stay tuned for ancient health secrets!